The Ordinary Life of an Extraordinary Girl: "The Road We've Shared"
I love it when I have the opportunity to guest post, especially when it is about our book! A few weeks ago one of the founders, Mardra, of a great new website and facebook page "The Road We've Shared" asked me to share about our book - the why and how. Needless to say, I was delighted. I love talking about our journey. Did I really write a book? 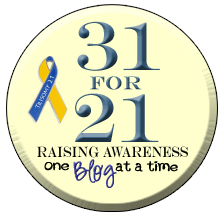 During the first year of blogging I began to realize I had a story to share. Alex is now 20 and a freshman in college. This did not happen by itself but was the culmination of years of advocacy and outright battles. But all along the way we honored Alex and her dreams for her future. We tried to create an environment where she could succeed and out of that took an unanticipated journey through the many systems that are in place. We traveled through the medical, educational, and state and local funding systems. We learned that was not enough, today’s systems are antiquated and do not meet the needs of this generation of children. As we followed in the footsteps of others who navigated and worked to improve the systems and we created our own footsteps between and around the systems and honored the work of so many past parents. We share our journey in verbs. 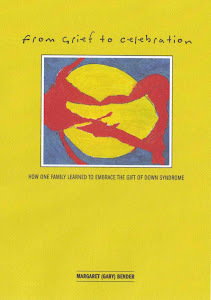 From Grief to Celebration, How One Family Learned to Embrace the Gift of Down Syndrome is organized according to a list of verbs that has defined our experience. As the title suggests, the verbs begin with "Grief" and culminate in "Celebration." The verbs numbered from 1-10 plus the bonus, are relatable to parenting and, frankly, life in general. There are a lot of great reviews here. I often wonder what possessed me to think I could write a book or even why I would want to write a book. A book is an investment in time, money and ego, all of which have been impacted by sharing our story in such a public forum. I wrote the draft using excerpts from the blog and hired a professional editor. I was foolish enough to send the manuscript out to a few publishers, all who rejected it with a nice letter about “receiving hundreds of submissions” so I self-published. story to share, one of hope and celebration and if I can help new families learn that their futures are bright I will feel fulfilled. You can find Alex and Gary on the blog: The Ordinary Life of an Extraordinary Girl. We are delighted she has shared the story about choosing to share her story! Of course, the best part is that we will continue to hear from Gary about their journey in the months to come.